The 142nd renewals the $2 million Kentucky Derby Presented by Yum! Brands (Grade I) and $1 million Longines Kentucky Oaks (GI) on the first weekend in May headline a roster of 26 stakes events – 23 of which are graded races – scheduled for Churchill Downs Race Track’s 2016 Spring Meet highlighted by six Grade I races and total stakes purses of $8.25 million. The racing program headlined by the Kentucky Derby, America’s greatest race, on Saturday, May 7 features seven graded stakes races – three of them Grade I events – with total stakes purses of $4.15 million. The Friday, May 6 program headed by the Longines Kentucky Oaks, the nation’s top race for 3-year-old fillies, includes a pair of Grade I events among its six graded stakes and total stakes purses for the day of $2.2 million. The 2016 Spring Meet stakes schedule includes seven racing days that will feature two or more stakes events and the meet’s total purses reflect an increase of$200,000 or 2.5 percentfrom the $8.05 million offered during the 2015 Spring Meet. The 38-daySpring Meet begins with the historic track’s “Opening Night” under the “Downs After Dark Presented by Stella Artois and Old Forester”lights on Saturday, April 30, and the featured event of the night that launches Kentucky Derby and Kentucky Oaks Week will be the second running of the $100,000 William Walker. The six-furlong stakes race for 3-year-olds honors Walker, one of the pioneer African-American jockeys who dominated the Churchill Downs jockey colony in its early years. Spring Meet racing will conclude with “Closing Night” on Saturday, July 2, the last of the meet’s three “Downs After Dark” night racing programs. Important changes in the 2016 Spring Meet stakes schedule include a new name, distance and placement for the $200,000 Wise Dan (GII), a 1 1/16-mile event on turf formerly known as the Firecracker. The Wise Dan is now part of the popular “Downs After Dark” program on Saturday, June 18 headed by the $500,000 Stephen Foster Handicap (GI).The Wise Dan had previously been run during the closing weekend of the Spring Meet. The Wise Dan is named in honor of Mort Fink’s two-time Horse of the Year who completed a spectacular racing career with a perfect four-race season in 2014. The Charlie LoPresti-trained gelding by Wiseman’s Ferry compiled a remarkable lifetime record of 23-2-0 in 31 races with earnings of $7,552,920. He earned seven of those victories from his 11 starts at Churchill Downs, which included a pair of triumphs in the Firecracker that included his successful debut on the grass in its 2011 running and a hedge-skimming victory over yielding turf in a driving rain storm in 2013. Wise Dan’s Churchill Downs success also included victories in the Grade I Woodford Reserve Turf Classic (GI) in 2013 and 2014, and memorable runs on the main track that included a victory in the 2011 Clark Handicap Presented by Norton Healthcare (GI) and a runner-up finish in the 2012 Stephen Foster Handicap in which he lost by a head to Ron the Greek. Wise Dan also earned a pair of Eclipse Awards as both turf champion and champion older horse. The Kentucky Derby Day stakes program is the most lucrative single-day Churchill Downs racing program in track history. 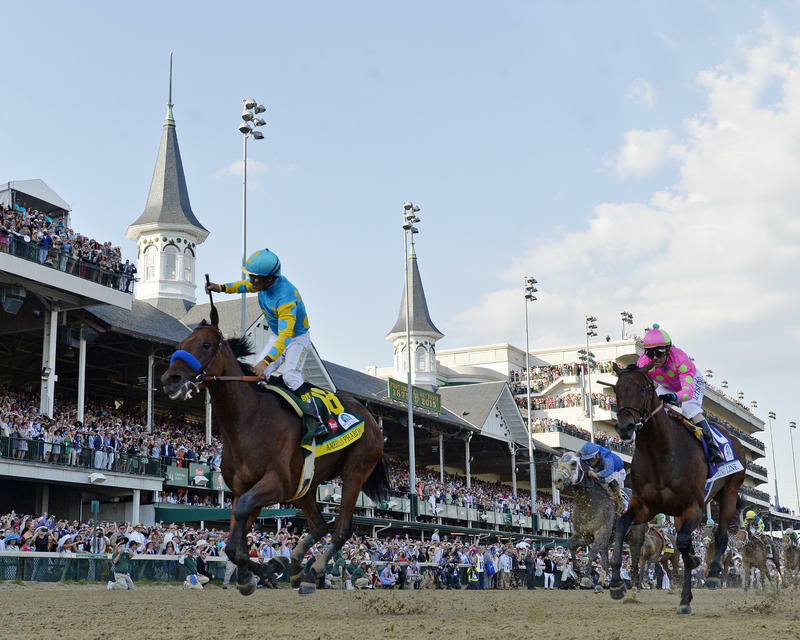 The Kentucky Derby, run annually since 1875 and America’s oldest continuously-held major sporting event, attracted a record crowd of 170,513 in 2015 that witnessed a gritty victory by Zayat Stables’ American Pharoah, the colt’s first step toward his historic sweep of the Triple Crown. His sweep of the three-race series was the first since 1978 and only the 12th Triple Crown in American racing history. The other Grade I events on the 2016 Derby Day stakes roster are the Woodford Reserve Turf Classic and the $300,000 Humana Distaff, a seven-furlong race for fillies and mares age 4 and up. 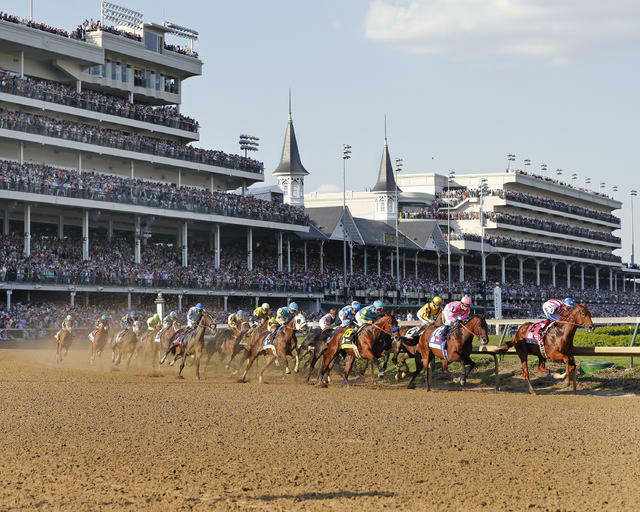 Other Derby Day stakes include the $500,000 Churchill Downs (GII), a seven-furlong main track race for 4-year-olds and up; the $300,000 Churchill Distaff Turf Mile Presented by Longines (GII) for fillies and mares age 4 and up at one mile on turf; the $300,000 American Turf Presented by Ram Trucks, a Grade II race for 3-year-olds at 1 1/16 miles on turf; and the $250,000 Pat Day Mile Presented by LG&E and KU, a Grade III event for 3-year-olds at a mile known until last year as the Derby Trial. The latter is named in honor of Hall of Fame jockey Pat Day, the all-time win leader at Churchill Downs whose success beneath the Twin Spires included a triumph in the 1992 Kentucky Derby aboard W.C. Partee’s Lil E. Tee. 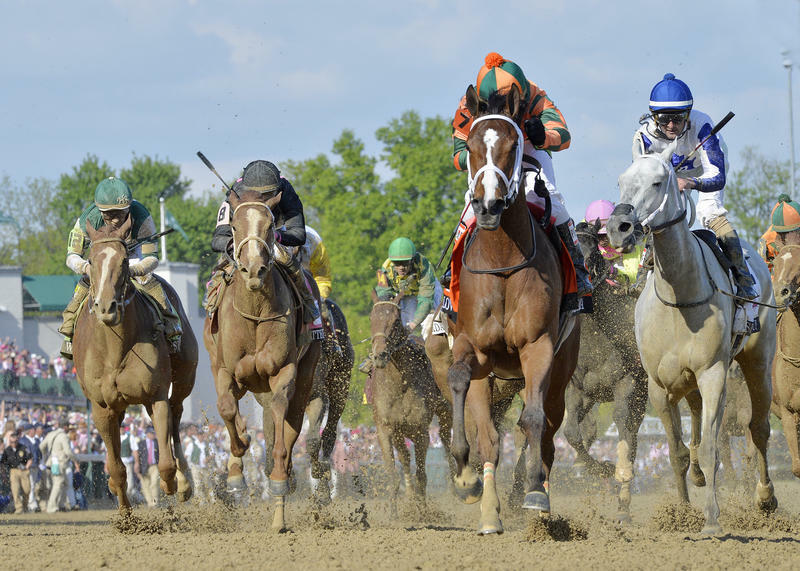 Joining the main event on the Longines Kentucky Oaks Day roster of six stakes races are the $300,000 La Troienne (GI), a 1 1/16-mile race for fillies and mares age 4 and up; the $400,000 Alysheba (GII) for 4-year-olds and up at 1 1/16 miles; the $200,000 Eight Belles, a seven-furlong race for 3-year-old fillies that has been elevated to Grade II status for its 2016 running; the $150,000 Twin Spires Turf Sprint (GIII) for 3-year-olds and up at five furlongs on turf; and the $150,000 Edgewood Presented by Forcht Bank, a 1 1/16-mile race for 3-year-old fillies on turf that will be run as a Grade III event for the first time. Restored to the Kentucky Derby Week stakes schedule for the first time since 2010 is the $100,000 Kentucky Juvenile, a five-furlong test for 2-year-olds that will be the racing highlight of Churchill Downs’ celebration of “Thurby” on Thursday, May 5. With the addition of the Wise Dan, the Stephen Foster Handicap and “Downs After Dark” program on Saturday, June 18 will offer five graded stakes races with total purses of $1.1 million. The roster also includes the $200,000 Fleur De Lis Handicap (GII), a 1 1/8-mile race for fillies and mares age 3 and up; the $100,000 Matt Winn (GIII), a race for 3-year-olds at 1 1/16 miles on dirt named in honor of Churchill Downs’ legendary president and Kentucky Derby impresario Col. Matt Winn; and the $100,000 Regret (GIII), a race for 3-year-old fillies at 1 1/8 miles on turf named in honor of the winner of the 1915 Kentucky Derby – the first of only three fillies to win the “Run for the Roses” during its 141-year history. The “Closing Night” celebration on Saturday, July 2 that includes the $100,000 Bashford Manor (GIII) for 2-year-olds at six furlongs, the $100,000 Debutante (Listed) for 2-year-old fillies at six furlongs and the Kelly’s Landing overnight stakes for 3-year-olds and up at seven furlongs. The Roxelana, an overnight stakes event for fillies and mares 3 and up at six furlongs on Saturday, June 25. Opening Verse – distance of overnight stakes on turf reduced to a mile from 1 1/16 miles. For a look at the complete Churchill Downs 2016 Spring Meet stakes schedule, click here .